You can only operate the moonroof when the power mode is in ON. 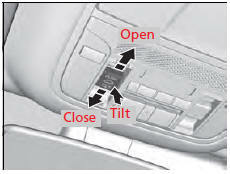 Use the switch in the front of the ceiling to open and close the moonroof. The power moonroof can be operated for up to 10 minutes after you set the power mode to VEHICLE OFF (LOCK).